In Part Three of this book, we explain why conventional forms of curriculum development are inappropriate for music teaching and learning. We argue that music educators and CM facilitators require a systematic, flexible, and interactive way of organizing music curricula to accommodate the natures and values of music, musical understanding, and musical processes and products. On the basis of the philosophy of music and music education developed in Part Two, and a concept of curriculum commonplaces, we propose a four-stage approach to music curriculum making that attempts to explain why and how music curricula ought to be organized and carried out as reflective musical practicums. Clearly, the values of MUSICS and MUSICS education are several and profound. And they are unique to musicing, music listening, and the multidimensional nature of musical products. And if this is so, then there can be no doubt that MUSICS education has a significant contribution to make to society in general and the education of school and community music participants in particular. 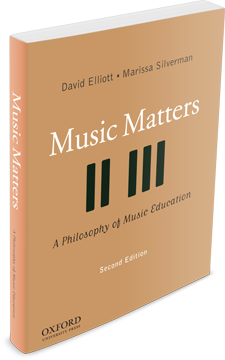 The second edition of Music Matters: A Philosophy of Music Education is divided into three parts (see the Table of Contents). In the coming days, as we build to our release date, we will be posting a summary of each of these sections. These will offer you a preview of the ideas and theories that we explore in the book. In Part Two, we consider the natures and values of musical understanding, musical processes, musical products, musical experiences, creativity, and musical values. Among other proposals, we suggest that musical understanding depends on two inter-related and mutually supportive categories of embodied musical knowing: musicianship and listenership. The sixteen interrelated types of musical thinking and knowing that make up the musicianship and listenership of each musical praxis and each form of musical understanding allow musicers and listeners to perform, create, and express many kinds of praxis-specific musical products (compositions, arrangements, improvisations, performances of each and all, etc.). From our praxial perspective, musical products can embody and communicate a wide variety of meanings, including artistic-structural, emotional, representational, cultural-ideological, narrative, autobiographical, and ethical meanings. Of course, what and how musical products embody and convey their meanings depends on the socially situated nature of the musical people, processes, products, and contexts involved. From this viewpoint, musical products offer musicers and listeners numerous ways of expressing, responding to, and making musical, personal, social, political, gendered, and other meanings during musical experiences and events. Following our considerations of musical understanding and musical products, we focus specifically on the nature and values of musical-emotional experiences, musical values, and musical creativity. Altogether, Part Two suggests that when school music teachers and CM facilitators engage with learners educatively and ethically—when we teach in, about, and through music—musicers and listeners of all ages, everywhere, gain multiple ways of pursuing their needs and desires for full human flourishing, or “eudaimonia,” which includes (but is not limited to) personal, artistic, social, empathetic, and ethical growth and fulfillment; lifelong and lifewide musical “particip-action” with and for others; health and well-being for oneself and others; social capital; self-efficacy and self-esteem; happiness for oneself and others; and a means of serving one’s community as an artistic citizen committed to acting artistically for social justice. In this view, participating in musical praxes is an exquisite way of growing, thriving, experiencing, and contributing constructively to one’s worlds. In addition to these values and “goods” of musical praxes, musicing, listening, and musical products extend the range of people’s expressive, responsive, and creative powers. When music education and CM are carried out educatively and ethically, with care and respect, people have opportunities to formulate personal-musical expressions of their deepest feelings and cherished beliefs and give artistic-cultural form to their powers of thinking, knowing, and valuing. Given the profound richness of musicing and listening, this praxial philosophy argues that musicing and listening are also significant insofar as musical products play an important role in establishing, defining, delineating, and preserving a sense of community and self-identity within social groups. Musical praxes constitute and are constituted by their cultural contexts and the social bonding that occurs in and through acts of musicing and listening of all kinds. Additionally, teaching and learning a variety of Musics comprehensively, as music cultures (through a praxial approach), amounts to an important form of socially inclusive, democratic education. Entering into unfamiliar musical cultures activates self-examination and opens possibilities for self-growth and the transformation of one’s relationships, assumptions, and preferences. During ethical processes of intercultural music education, guided by practical wisdom, or phronesis, teachers and learners can confront and reflect critically on their prejudices (musical, personal, social, cultural, political, and gendered) and face the possibility that what they believe to be universal is not. In the process of welcoming learners into unfamiliar musics, music educators and CM facilitators link the primary values of musics and music education to the broader goals of democratic-humanistic education. In Part One of this book, we propose that school music educators and community musicians should consider the interrelationships between music, education, and personhood. Because music is made with and for people, people are at the core of all musical transactions. Hence, we are against foundational thinking that conceives of music narrowly—as nothing more than pieces or “works” of music alone. Musics result when persons engage in critically reflective actions and active reflection within musical praxes, at specific times within specific cultures. And depending on those times and cultures, musical praxes refine and redefine themselves in relation to the people they are made and created for. Indeed, musics are embedded in and derive their nature and significance from their contexts of production and use. Even the structural properties of musics owe their characteristic features to the reflections of practitioners and theorists who work at particular times in the history of their music-cultural belongingness. Accordingly, musics are thoroughly artistic-social constructions. MUSICS, considered globally, are the diverse human praxes of making diverse kinds of musics for different kinds of participants and listeners. And EDUCATIONS, considered globally and carried out as praxes, refers to all possible instances, forms, and transactions of educative and ethical teaching and learning.